Rajya Vidyut Utpadan Nigam Limited, Rajasthan has released the RVUNL Admit Card 2018 at the official website www.energy.rajasthan.gov.in. The RVUNL Admit Card for Junior Accountant, JEN(C&I/Communication, F&S, Civil), Informatics Assistant, Junior Chemist & Jr Chemist, AEN(Elect./Mech., civil & IT) was released on 12th July 2018. The Rajasthan Energy Department Recruitment 2018, had released a recruitment notification for 1179 Junior Engineer (JE), Informatics Assistant (IA), Junior Chemist, and Assistant Engineer Posts. Candidates who have applied for this recruitment can download the RVUNL JEN Admit Card 2018 directly through click on the link mentioned below. 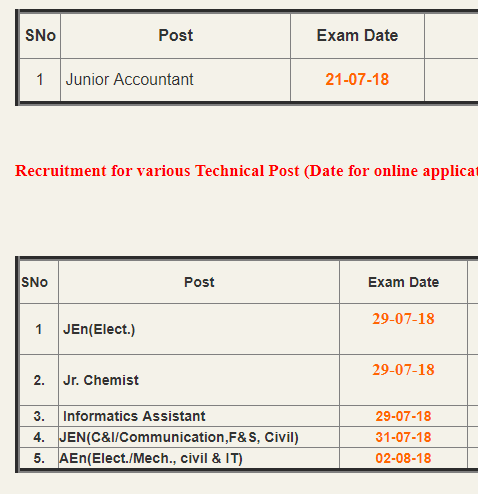 Latest Updates: RVUNL JE Admit Card 2018 has been released for the post of Technical such as Junior Accountant, JEN(C&I/Communication, F&S, Civil), Informatics Assistant, Junior Chemist & Jr Chemist, AEN(Elect./Mech., civil & IT) exam. The Department has set an exam to be held on 29th July 2018. The RVUNL Admit Card has been released. Candidates who have applied for the Examination will be able to download the Admit Card. The RVUNL 2018 Admit Card issued only to those candidates who have successfully registered themselves for the Recruitment. This is a State Level Examination that is conducted by the Rajasthan Rajya Vidyut Utpadan Nigam Limited (RVUNL). Candidates can download RVUNL Admit Card 2018 by entering the required details. Rajasthan RVUNL Admit Card 2018 has released for JEN (Electrical/ Civil/C &I/ Communication/ Fire and Safety), Informatics Assistant, Junior Chemist and AEN (Electrical/ Mechanical/ Civil/ IT). Candidates will be selected for the Job on the basis of the Online Written Examination (Computer Based Test). The Exam will be held from 29th July – 2nd August 2018. The dates for RVUNL JE, Jr. Chemist, Informatics Assistant and Assistant Engineer has announced. The Written Examination will be held in Rajasthan, Delhi NCR, Haryana, Punjab, Maharashtra, Madhya Pradesh (MP), Gujarat at the selected cities. The language mode of the Examination is English only except for the Hindi Subject. The JEN Admit Card is available on the Official Website. Search for the Rajasthan JE Admit Card 2018 Download Link. A Login Page will be redirected on your screen. Enter the required details that are asked such as the Registration Number/ Roll Number and Password and Date of Birth. The RVUNL Admit Card for the desired post will be displayed on the screen. The Admit Card is available in the PDF Format, therefore it is easy to download. Download and take the Printout of the Admit Card and keep it safe till the completion of the Recruitment procedure. List of Instructions followed by the Candidate during the Examination. The RVUNL Admit Card is a very important document that has to be carried by the candidate during the Examination. It serves as an Identity Proof to the candidate who is appearing the examination. It contains all the details about the Examination and the Candidate. No candidate will be allowed to appear the Examination without a RVUNL Admit Card 2018. Candidates are advised to download the Admit Card before the date of the Examination to avoid any technical issues. The Exams will start from 29th July 2018. Candidates must check the Official website to get the latest updates and notifications regarding the recruitment.